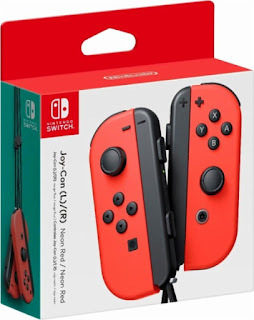 Today ONLY - Nintendo - Joy-Con (L/R) Wireless Controllers for Nintendo Switch $74.99 (Retail $79.99). Take cord-free control with this vibrant Nintendo Switch neon red Joy-Con controller set. Equipped with a full set of buttons and compatible with your existing Joy-Con grip, this controller set works perfectly for single-player or multi-player action. Each unit in this Nintendo Switch neon red Joy-Con controller has an integrated accelerometer and a gyro sensor for versatile gaming fun.